Many women feel that there is a serious lack of ladies over 40 representing fashion and brands in the modelling world. I have been told by many mature ladies that they feel certain looks and fashions are not for them and that they can’t wear items they would have years before. It’s always such a shame when women lack the confidence to wear selected clothes because of their age, size and other factors. 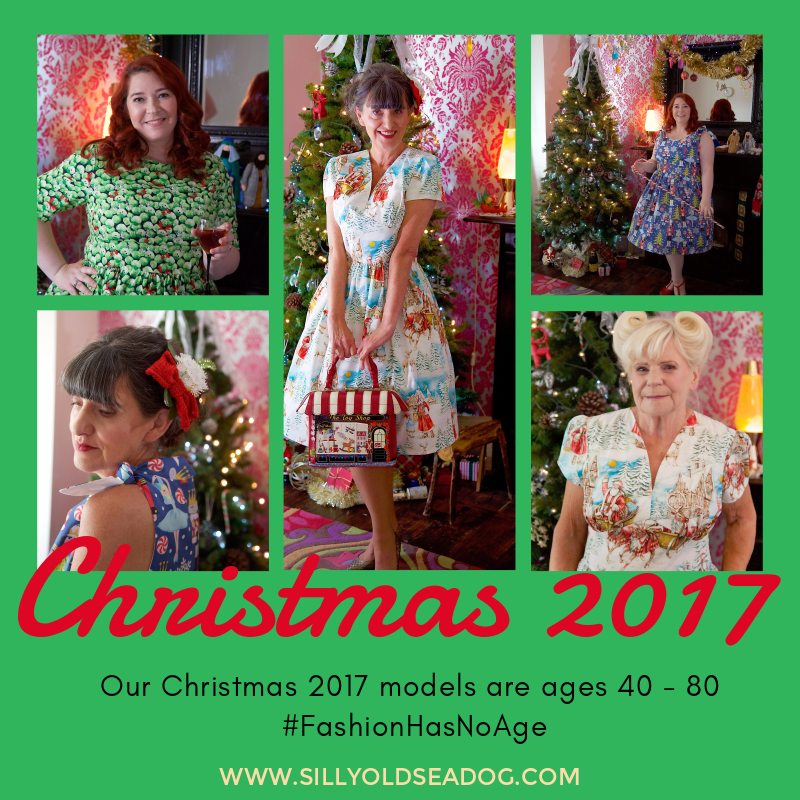 That is why, for our Christmas 2017 campaign we have gathered 3 fabulous ladies together, aged from their 40’s to nearly 80, to model our collection. Kelly is a Teacher, who has worked all over the world, including in the USA. Kelly has recently had her first son who is 16 months old. She has never modelled before, and was really excited to participate in our shoot. Kelly has been a great model as she is really bubbly and confident, and nether I, Lisa our Photographer or Keeleigh our Make Up Artist could believe she hadn’t done it previously! Kelly loves colour, she has been told that more mature ladies “shouldn’t wear colour”, but I think that today’s shoot proves that point wrong as all the ladies look great! She also really liked the length of the dresses modelled (all 3 of these are in our longer 62cm skirts). Kelly’s Favourite dress is the Silly Old Sea Dog Nutcracker Dress. One for the colour and style, but also because she used to be a dancer, and it brings back fond memories. . As a feeding Mum, the fact that the dress ties on the shoulders, is also a plus as it could be opened easily for feeding, something which Kelly has said is difficult to find for Mum’s, while wanting to remain stylish. 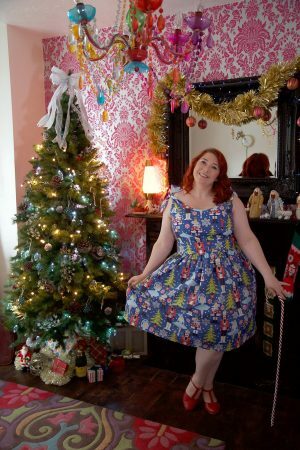 Her favourite Christmas pastime is making and decorating a Gingerbread House on Christmas Eve, Kelly is a keen crafter, especially when it comes to cooking, sewing and knitting! Kelly also loves turning on the Christmas lights for the first time as it is a magical moment. 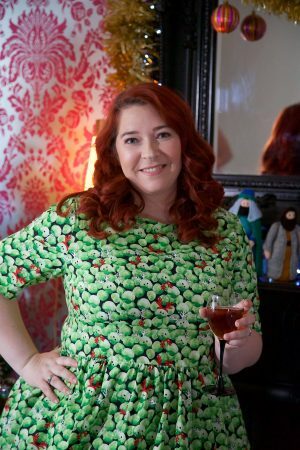 What would Kelly’s advice be to ladies over 40 who are not so confident with their style and are looking for the perfect Christmas outfit? “Age like dress size, is just a number. What is important is how the clothes make you feel”. Suzy has worked in the modelling industry for 40 years having previously also owned and managed a modelling agency, before retiring in her 40’s due to ill health. Suzy took up modelling again at age 57 after realising there was such a lack of professional mature models in the industry, she has been featured in many local publications and also in national press. Suzy enjoys modelling as both a profession and as a hobby, sometimes helping out local photographers with fun and interesting shoots. 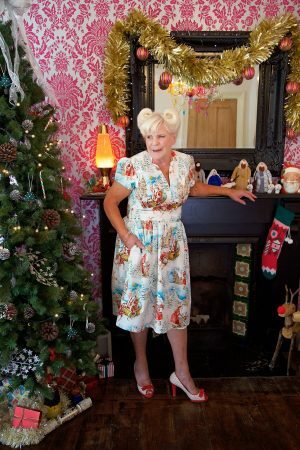 Suzy is also a little vintage obsessed, but her main style is anything brightly coloured and fun. 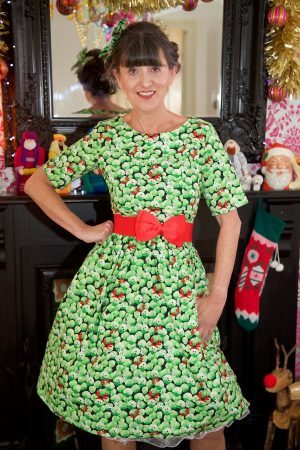 Which is why her favourite dress was our Christmas Sprouts Dress. At 66 Suzy is a keen swimwear model, and has no objectives to modelling bikinis and lingerie. But, for those ladies who feel a little more self-conscious, she agrees that the Sprouts Dress is perfect as it has a sleeve to cover up if you are conscious about your arms, and a longer 62cm skirt. Her favourite Christmas Day activity is a stroll with husband John and their Dog Venus on their local beach. Especially as we have such lovely beaches and coastal walks in Cornwall – this is normally followed by a home cooked Christmas Dinner and game of chess in front of the log fire. I asked Suzy what advice she would after to ladies her age looking for something to wear over the Christmas season “I would say to always put comfort first when choosing an outfit and wearing it for a long period of time, but all of the pieces today have made me feel that way, and very glamorous too. I would never listen to anyone who tells me I can’t wear a certain something because of my age, I wear anything and everything that I like, that’s what is important”. Suzy is pictured also modelling a fabulous bag from Vendula, The Toy Shop Bag gave a fun nostalgic Christmas feel to the outfits, we all agreed it paired perfectly with the Silly Old Sea Dog St Nicholas Dress for a fun evening look, or even to wear casually in the day for a festive event. 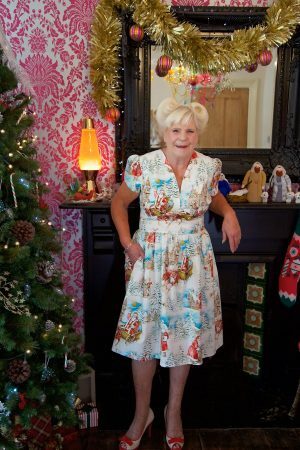 79-year-old vintage enthusiast and former Racecourse Concierge Marlene had been up since 3am as she was so excited to model our Christmas collection, and although nervous she was very excited. Marlene has always loved make-up and is never without it, after I asked all the ladies to turn up to the shoot make up free (for Artist Keeleigh to work her magic) Marlene had to send husband of 60 years, Brian into the supermarket to get her lunch as she was not fully dressed without her lipstick! Her day to day fashion style is 1+40’s dresses, furs and hats, and wearing dark tnes such as black, brown and grey. She had never tried a colourful patterned 1950’s dress before, so trying on the Silly Old Sea Dog collection was a first. Our dresses are’t something Marlene would usually choose and she didn’t know what to expect. However once the dress was on, and she saw herself in the mirror, she felt very festive and feels the dress would be great to add some fun to Christmas Day celebrations. Marlene likes to walk on the beach on Christmas Day. She is a people person and loves socialising and meeting people, so walking on the beach with husband Brian on Christmas Day is always a joyful experience as there are lots of people to meet and dogs to say hello to. Marlene has been married for 60 years, and has many lovely memories with her husband, including one comical memory of receiving a very large box for Christmas, and thinking it was something really exciting, before opening it and finding out it was disappointingly a tumble drier! 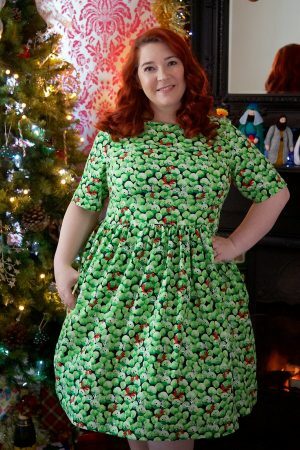 This entry was posted in News and tagged #stylehasnoage, 40 plus models, 40 plus style guide, Boxing day, Brussels Sprouts, Christmas, Christmas 2017, christmas campaign, Christmas Day, Christmas Dress, Christmas Eve, Christmas Gift, Christmas Gifts, Christmas Jumper, Christmas Outfit, Christmas Party Dress, Christmas Party. Christmas Party Outfit, Christmas Style, Christmas Vintage, dressing over 40, Father Christmas, Festive, festive over 40, Gifts, Holiday Dress, Holiday Outfit, Holidays, mature model, mature models, New Year, New Years, New Years Eve, Party Dress, Party Outfit, photoshoot, plus size, Plus Size christmas, Plus Size Christmas Dress, Retro Christmas, Santa Claus, Sprouts, Style, Style Guide, Style has no age, The Nutcrcaker, vintage, Vintage Christmas, vintage inspired, What to wear, what to wear for Christmas.